Sandstorm lives for action. His only real fear is a fear of boredom. As a result, he takes unnecessary risks, both in combat and out - risks that can sometimes threaten the success of his missions. He lives fast, loud, and dangerously - traits that make him fun to hang out with most of the time. But his fellow Autobots are getting a little sick of his habit of giving away his position to the Decepticons just so he has the opportunity to enjoy a fight. I�ll just preface this review with the fact that I don�t have much previous love for this character or his toys. Anything I know about Sandstorm�s backstory comes from reading Wiki�s online and watching Season 3 of the G1 cartoon. To be honest, I didn�t really care for the character that much while watching the original cartoons, and any episode Sandstorm was in wasn�t terribly exciting to me. Needless to say there isn�t a good reason for me to pick this toy up outside of being a Transformers fan in general. However, I already own the fantastic Springer toy which uses this base mold; this became the major driving force behind owning Sandstorm. Just so I don't have to mention this for every mode, it's absolutely amazing the amount of changes between the two; though they come from the same parent mold, there's so much remolding that the two often do not look alike. All three modes have different mold details and the color changes are so different that owning both Sandstorm and Springer truly is like owning two different toys. This isn't the same old new paint job, new head that we are usually treated to. This is a far different (and welcome) beast. Sandstorm's dune buggy mode is rather bulky, and I'm not 100% sure it classifies as a true dune buggy. However, it's has massive rugged wheels on the back some slatted side windows, and a huge steel brush guard on the front. So I guess that gets it close enough! The dune buggy mode (accurate or not) is really quite fun. Detailing is abundant with several distinctly molded features like the front fenders, the front brush guard, the orange 'armored' top, and the very large rear wheels. The color palette is a mix of yellow (not incredibly bright, more like a construction vehicle shade of yellow), orange, black, and a bit of silver. The heavy molded detail and coloration give Sandstorm a distinct difference from the Springer mold. In dune buggy mode, black coloration is more apparent on the sides of the vehicle, as well as on the wheels. 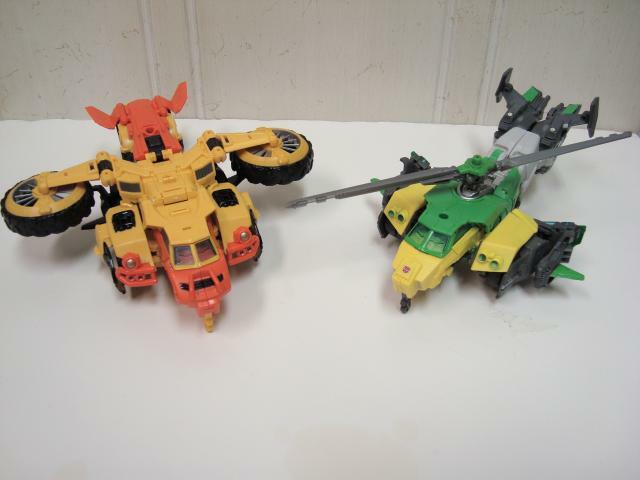 The colors are very different for each mode: the VTOL aircraft features a bit more yellow than the other two modes, while the robot mode features a bit more orange. This change in coloration gives a fresh feel to each mode. The dune buggy mode fits snuggly together without any loose fitting tabs. The quality is solid, and you can store the gun on the top of the mode. There really isn't any random kibble hanging off the dune buggy. Overall, the dune buggy mode is well done. Another mode that doesn't quite fit into anything realistic. Sure, it has VTOL engines, but I don't think it's designed to mimic anything from real life. Real or not, this is a good mode, and fun to play with. Sandstorm's giant dune buggy wheels flip over to reveal large vented engines for VTOL purposes. The front fenders of the dune buggy shift back a little, making some tiny side wings. I was impressed by subtle changes to the transformation scheme at this point - if you fold the wings together like in Springer's helicopter mode, the VTOLs bump into them. However, a slight change to the wing transformation allows everything to snap together nicely. I guess it pays sometimes to read instructions! 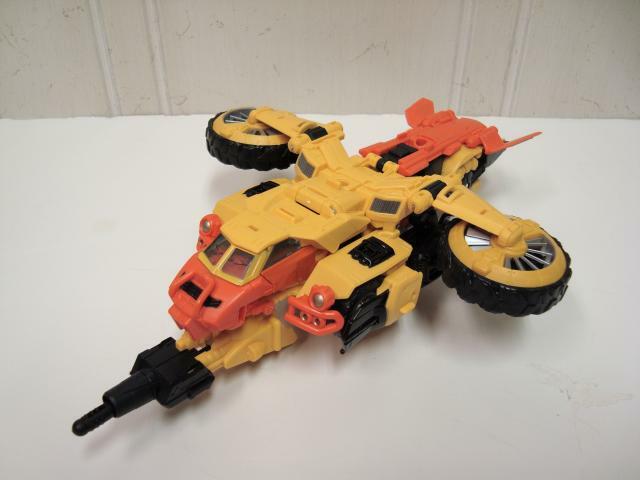 As mentioned earlier, the VTOL aircraft mode features more yellow coloration, with some spots of orange and black. Mold detail is well done here too, though it kind of resembles some shifted dune buggy parts. The VTOL mode is quite sturdy, and you can still snap the gun on the underside of the aircraft nose for storage. This isn't the best mode of the three, but it's fun enough to not be forgotten. Sandstorm has a very imposing robot mode. The VTOL engines on his back and the brush guard on his shoulders give Sandstorm bulkiness that is missing on Springer. Aesthetically you will find a larger portion of orange color in robot mode, but excellently broken up with yellow, black and some silver. The orange is mainly seen in the chest, knees, and the plate over his head (which is a nice nod to the G1 toy/character model). I should note though, that the orange plate over the head can also be folded down flat to the back, so if you prefer your Sandstorm with less headdress, feel free to do so! Molded detail is just as good here as it is on the rest of the modes. The arms on Sandstorm are exactly the same as the are on Springer (save for the shoulder molding), but the lower legs are very different. Where Springer had the car mode rear wheels on his shins, Sandstorm's legs have been remolded to have black and silver shins without a wheel. The knees/landing gear has also been completely redone. There's a bit more black and silver detailing on the chest as well, where Springer's chest is rather flat. The color palette and molded detail give Sandstorm a heaping portion of variety throughout the robot mode. Now for the head: I absolutely love this mold. It's drastically different from his mold-mate, and in my opinion is a fantastic update to the G1 cartoon version. Sure, the G1 toy had a faceplate, but I think this head works better with a real face. The light piping is fantastic and the eyes glow blue without much of a light source. 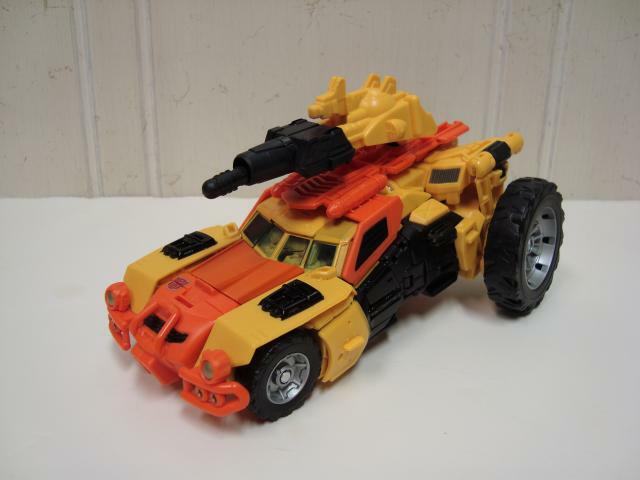 Last but not least, Sandstorm comes with a hefty rifle that fires one missile. 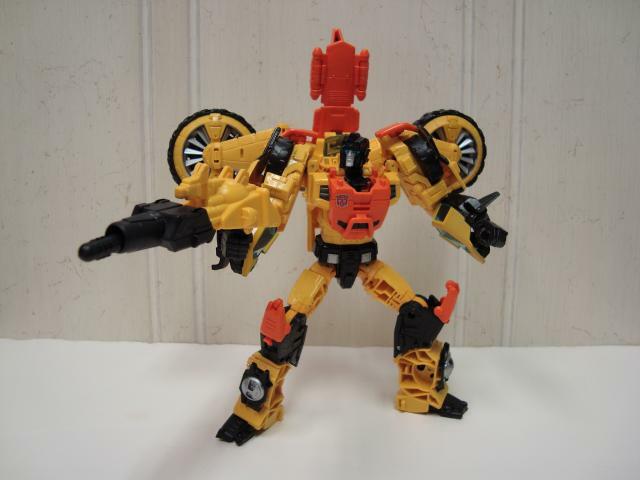 The color is a mix of black and yellow, and the gun has the same firing mechanism as Springer's gun. The length is long enough to be held two handed like a rifle, but short enough to be wielded single handedly. Sandstorm has a good amount of articulation, but he's slightly hampered by his heavy back. Don't get me wrong, you can get him into some great fighting stances, but don't expect anything crazy with those large VTOLs hanging on his back. On a final note, Sandstorm is a fine toy. Using the same basic mold as Springer but with heavy retooling, this is THE proper way to retool/remold a Transformer. There are three great modes to be had, a simple, yet satisfying transformation scheme, a beatiful color palette, and a good amount of fun. Sandstorm is easily worth consideration if you see him at retail. You don't have to own him, but you won't be sorry if you do. Transformation Design: 7. 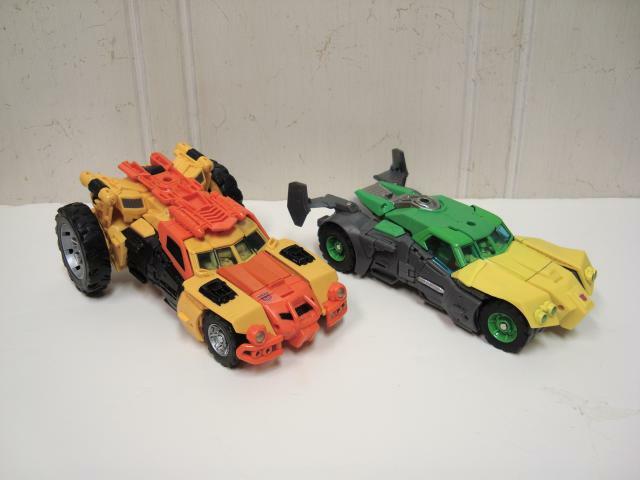 There�s quite a bit of fun to be had in a Triple Changer. And he isn�t frustrating like Universe Tankor. Everything simply moves well and is quick to change to all 3 modes. Durability: 8. Just like Springer, Sandstorm is pretty sturdy - a step up in quality from recent figures. If anything is going to break, it may be a small tab here or there, or maybe one of his back appendages. Aesthetics: 8. If you like the design itself, like I do, you will love this figure. Three modes that all look good (VTOL Aircraft could be iffy), with bright coloring and black accents. This guy will definitely stand out amongst your collection. 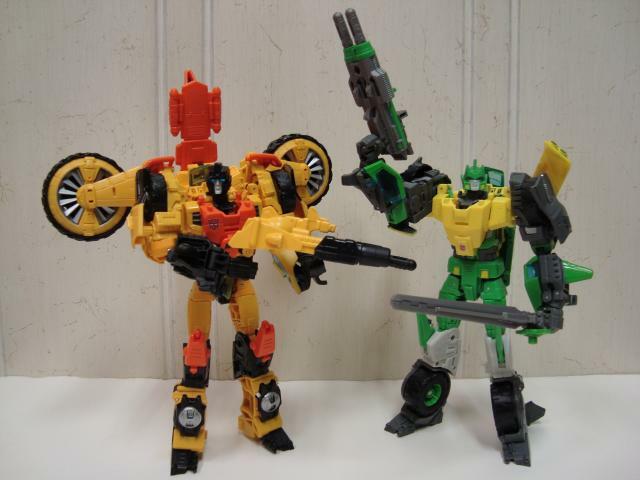 The amount of remolding between Sandstorm and Springer is astounding. Articulation: 7. No problems per se, but the VTOLs on his back give some balance issues. Overall, nothing is hindered by his joints. Value/Price: 9. Voyagers are $22-25 USD these days. The value is boosted by the fact he�s a Triple Changer, and a good one at that. Overall: 9. There are some issues with balance and the lack of a place to hide the VTOLs in robot mode. I won�t say you need to pick him up, but he�s aesthetically fantastic and loads of fun. Easily worthy of your money. This is how remolds should be done.